Squint. It could be Paris. After having croissants in Paris, and yes, that’s plural, and yes that means too many consumed to count, the random “crescent” available around town just doesn’t hold up. In truth, they didn’t before Paris, either, but one convinced oneself if it came from a place like Le Pain Quotidien (a place we love, to be sure, but…ce n’est pas Paris). 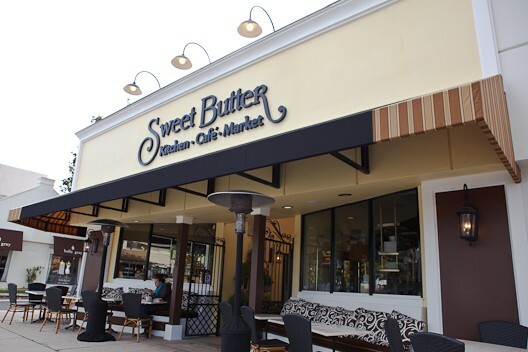 Anyway, because I brake for bakeries, I pulled over to the Sweet Butter Kitchen in Sherman Oaks recently. Very cute, French in its own way, et voila, croissants. Of a recognizable size (not a baseball glove, hello Starbucks). I bought one. I went to my car. I opened the box (!). I pulled off an elbow. Buttery flakes all over — a very good sign. One bite — very nice. Two bites — nicer still. Three, four, five, whatever, it was gone. Now, I like a croissant that flakes like January in Chicago but has a sort of chewy, pully inside. These do. The butter flavor is subtle but noticeable. Not Paris, but you know, better than most of what’s on offer in le vallée de San Fernando. I’ve since returned many times. I’ve had the croissants with jam, with marmalade — they are swell. As to the other treats — Sweet Butter puts a heavy emphasis on the “sweet.” Well made and texturally on target, but most are tooth-achingly sugary for me. This entry was posted in Reviews by Caroline Siemers. Bookmark the permalink.